☄ Bilus! | Semi-open, free MYO slots! Bilus (pronounced: bee-loos, singular: bilu) are a new semi-open anthro species, characterized by the glowing marks and freckles on their skin and the glowing lanterns they carry at all times. The lanterns they carry house their souls, and help guide lost souls to them so they can help usher them into wherever they want to go after death. They're very proud of their glows and love to show them off, unless it's too dangerous for them to do so. Bilus themselves are a genderless/sexless species--they are born when a soul wanders into a lantern and grows into a Bilu. Bilus can use any pronoun they are comfortable with. In conversation, most default to the neutral "they/them" until they learn which pronouns the Bilu they're talking to are comfortable with. Personality-wise, most Bilus are calm and non-confrontational. Bilus live in a semi-open universe: other species/characters cannot enter the Bilu homeworld (except for during special festivals), but Bilus can enter other worlds and universes. In the Bilu homeworld, all adult Bilus can choose to work in a variety of jobs!! To read more about the Bilu homeworld and their jobs, click here! you're free to use or not use the lore as you want! the only thing you need to keep are the lanterns housing their souls, since that's kinda the defining characteristic of this species, haha.
.: Free MYO Slots :. As a semi-open species, you're able to claim a common MYO for free! you must first ask to claim a slot, then i will give you a registration code to mark that you have an officially recongized bilu! there is a free-to-use base listed in the links at the top of this post that you can use to help you design your MYO bilu. free MYO bilus can never be resold, only gifted or traded. please read the tos linked above for full rules! your MYO design will have to be approved by me before you can begin using it, however. you can only have 3 unfinished MYO slots at a time, so if you want to keep creating bilus, you'll need to finish and get your designs approved by me to claim more MYO slots. - For common/uncommon MYOs, skin color needs to be a mid-to-dark color, with bright/pastel glow freckles. - Eyes, freckles, and lantern glows all need to be the same color. - Freckle glow extends to fur tufts and wings as well! - You're free to design any lantern or staff you'd like! Don't feel limited to what's available on the base. - Clothing, if you want to design any, needs to be sheer/translucent so the glow markings can shine through, UNLESS you are making a bilu in the defender/merchant jobs. Bilus are proud to show off their glow markings! - You don't need to use the myo base provided, but i may ask that you provide a list of traits if you don't.
.: Rarities & Pricing :.
.: Adopts for sale :. 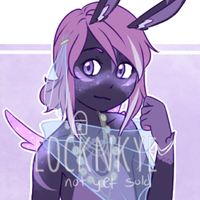 To claim your free, common MYO slot, either pm me here, or post in the thread to claim! no need to ping me, i'm subscribed and i will get the notifications, i promise. c: also, please specify if you want to claim an uncommon slot or higher! otherwise i'll just assume you want the free common slot and that's what you'll get, haha. We also have a discord server where you're free to join and drop in wips of your MYO designs if you like! Invite link is at the top of the post. You don't need to own a bilu or a MYO slot to join~ it's currently a very small, extremely chill server, haha. i'm also working on making a group for them on deviantART! 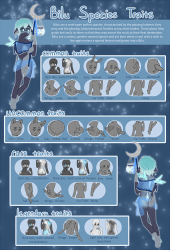 update feb 13, 2019 released three new uncommon traits!~ the traits sheet and bases have been updated to include them, and i also added a few more lantern and staff options to the myo bases as well! if you're still working on your MYO design, you're free to use the new traits as well!~ also planning on holding a fun little sale and contest in march!~ more details on that will be released march 1st, so keep an eye out! StrawberryLunala alright! i'll be sending you a character transfer with the registration code in just a little bit. as far as making the design, you're free to wait a few days until i get the visual traits sheet up and draw it out yourself! it's not required to use the myo base, i just wanted to provide one for those who would want it. i did consider making a .png version where you could select and drag the traits onto it, but i feel like that'd just get complicated. sounds good! oh, and MYO slots have no expiration or due date, just so you're aware! I would be interested if they're free. id like to claim two of the myo common slots! ill probably design one pretty soon!! MudTalon okay! you'll get a character transfer from my other account soon! again, you're free to wait to make your design until I get the visual traits sheet up, otherwise you're free to use the MYO base too! FullofBones sounds good! you'll get a couple character transfers soon. I'd love to claim a couple MYO slots (just common), please! (Won't be designed until I get a new tablet though; my current one is broken. Hopefully the MYO slots don't expire? FullofBones Mm, kind of. it's not that they can't eat meat, they just don't have the means to get any in their homeworld. but they don't strictly eat only plants either. like they can eat breads and dairy like cheese as well as fruits and veggies. they love noodles in fact! it's a main staple of their meals. dairy products are a little harder for them to come by since they have to trade with non-bilus to get it as they don't have any means to make it themselves. but they grow their own wheat and grain to make bread! sorry if the wording was confusing, but I didn't want to just call them herbivores since they can eat other things besides plants. so hopefully that clears it up a bit!